The Cowboys had a bit to prove against the Panthers at 1300SMILES on Thursday, having lost both of their previous games, and having been somewhat exhausted by two big away games at Suncorp and AAMI Park. Conversely, Penrith were anxious to prove that they could recover after the devastating news that Nathan Cleary would be off the park for the next ten weeks. Add to that the fact that the Panthers have only won five of their nineteen fixtures in North Queensland, and that the Cowboys had only won two of the four Thursday night games in team history, and the stage was set for an epic clash between two teams desperate to take home the victory. From the very outset, it was clear that James Maloney was determined to stand up in Cleary’s absence, with the ex-Shark forcing an error from Justin O’Neill in the opening minutes of the game. Following another penalty for Penrith after Isaah Yeo was held up in the ruck, Maloney immediately barked out the orders to his team to opt for the two, lining up the tee himself and slotting through the ball as effortlessly as Cleary has. Given how amazing Cleary’s kicking record already is, it’s easy to forget that the Panthers also have a considerable kicking asset in Maloney, who has apparently been practicing his work with the boot as if he were still the primary goalkicker – a professionalism that more than paid him dividends over the evening. Nevertheless, the Panthers were the next to give a way a sequence of penalties, conceding three straight to get the Cowboys right up to their line, with North Queensland choosing to tap and go for the third and Matt Scott almost crashing over on the fourth tackle. A grubber from Johnathan Thurston initially looked to have sealed the deal, only for Dylan Edwards to clean it up and make a valiant effort at getting back in the field of play. He didn’t quite make it, however, and to make things worse for the Panthers, they conceded another penalty on the first tackle of the goal line dropout, thanks to a combined shoulder charge from Reagan Campbell-Gillard and Trent Merrin that somehow stopped Jason Taumalolo right in his tracks. It was even more of a let-off, then, when the Cows lost the Steeden a few tackles later and granted the scrum feed to Penrith – enough of a let-off for the Panthers to get a second wind after their spectacular opening minutes, and for Maloney to recover the leadership he’d exemplified so brilliantly in the leadup to his penalty goal. This time, he took advantage of a dummy and pass from Peter Wallace to drift into the line, demonstrating a master’s sense of time and an impeccable intuition for the defense, waiting justing until Justin O’Neill had come out of his line a player over to send out a short ball to Viliame Kikau right in front of Michael Morgan’s chest, with the Tongan representative crashing over before Ben Hampton could stop him. The Panthers didn’t stop bleeding penalties, however, with Waqa Blake fumbling a pass from Tyrone Peachey a couple of sets later, only for Jordan O’Neill to quash whatever momentum the Cowboys might manage to build on top of it with a minuscule error in the play-the-ball that was barely visible from a distance. Once again, the mountain men consolidated in the wake of a North Queensland mistake, with the team now putting in arguably the most spectacular and serendipitous team try of the 2018 season off the back of a frustrated fifth-tackle grubber from Maloney. At first, Maloney’s kick looked like a no-go, bouncing off the legs of the defence and richocheting back towards the Panthers’ attack. Thinking quick, however, Reagan Campbell-Gillard booted it forward again, and from there it hit two other pairs of legs after Thurston launched forward but failed to clean it up. First, James Fisher-Harris got a foot to it, sending it out to the left where it edged off Hampton to finally find Maloney, in what briefly seemed more like a game of soccer than rugby league. Of course, there was some luck in the four points, but the Panthers also deserve credit for never giving up on the play, while Maloney showed the same consummate sense of leadership and vision by getting just where he needed to be to make the most of Fish’s initiative. As he sailed through a challenging sideline conversion, the Panthers found themselves leading 14-0 – after having trailed 14-0 for their first three games of the season – in what felt like the definitive moment at which Penrith proved that they could still shine minus Cleary, however much they might miss him. 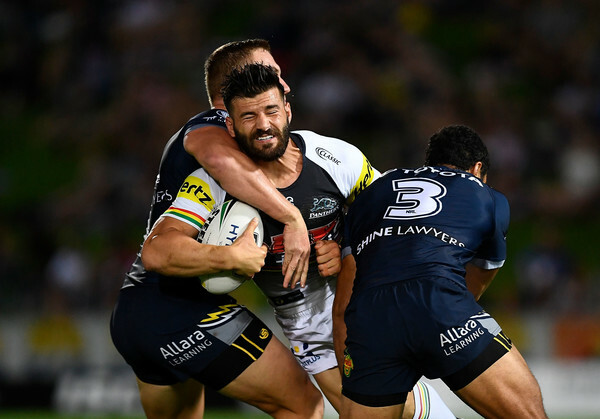 To stay in the game – especially at 1300SMILES – the Cows had to score before half time, and so they did, but only after James Tamou was sent to the sin bin for his 200th game after a fairly foolish second effort right on the Panthers’ line. The bin had been coming all evening for Penrith, and North Queensland seemed to have steeled themselves for it, now putting in a brilliant set play in which Thurston sent the ball across to Coen Hess, who span around backwards and sent it to Morgan who in turn shot a cut-out pass in front of O’Neill to find Feldt waiting for it out on the wing. It was the kind of clutch try that Feldt lives to score, and not even Josh Mansour hanging around his waist could prevent him getting the ball to ground, although with the Cows failing to add the extras they headed into the sheds still trailing by ten. Perhaps that’s why motivated Taumalolo to put in the hit-up of the night on Yeo after they returned to the field, but any leverage was quickly swallowed up in a penalty goal for Penrith that Maloney slotted through the posts just as Tamou was trotting back onto the park. With Maloney kicking a superb 40/20 a few sets later, Penrith had reset the game, and the Cows were once more scrambling on their line. While the 40/20 might not have produced a try, it did give Maloney another shot at penalty goal, bring the Panthers to five times the Cowboys’ scoreline at 20-4. Shortly after, Penrith put in a stunning defensive sequence, trapping North Queensland on their try several times in a row, and putting them under so much pressure that when they were finally let off the hook they scored almost immediately, so urgent was the need to put some points on the scoreboard and avoid getting trapped once again. Glimpsing a gap in the Penrith defence as soon as they could, the Cows got down the other end of the field, where John Asiata ran up to the line, drawing in the mountain men before popping the Steeden across to Thurston, who sent it over to Hampton in turn. From there, the stand-in fullback sent a cut-out pass out to Antonio Winterstein, who grounded the Steeden as emphatically as Feldt had in the opposite wing, but not without a massive tackle that saw him taken off the field before he had time to enjoy the try, or to see JT somehow boot the conversion away to the right. While the four points had been built on the back of a barnstorming run from Scott Bolton, it was no coincidence that the Cowboys had once again crossed over in the wing, with the strength of the Penrith ruck having kept them out more emphatically, in these fifteen minutes, than any other outfit this season. While both teams had score two tries apiece, the Panthers were a staggering twelve points ahead, and they proceeded to make it eighteen points off yet another bit of initiative from Maloney. This time it was a crossfield bomb that did the trick, with Jimmy booting the footy over to the right side of the field in what looked like a bid at a goal line dropout. Little did he think that Blake would jump high enough to catch the ball on the full, with the replay showing that the Penrith centre had managed to grip the Steeden against his chest with his elbows, gradually – but never quite – letting it slip to the ground on his way down, and holding it up with his knees before ever so slightly regaining possession just before he hit the turf and put down the next Penrith try. Between Maloney’s kick and Blake’s catch, it was exactly the mixture of strength and serendipity that had marked the Penrith game as a whole, with not even Ethan Lowe’s massive leap into the air able to prevent Blake from having his moment in the spotlight. With Maloney adding the extras as reliably as ever, it was astonishing to pause and think that this is a team that also boasts Cleary amongst its playmakers and as its goalkicker. Ironically, having him off the field has only clarified the Penrith depth, and will be an even greater incentive towards his and Maloney’s synergy in the halves when he returns to the park in ten weeks to resume his visionary role. About ten minutes out from the end, the Cowboys received a sustained period of possession, in what felt like their last real bid to mount a comeback against such a dominant Penrith side. On the first set, Matt Scott almost made it over, glimpsing some space that the Panthers just as quickly closed up, with Blake knocking the Steeden back to gift the hosts another go. Once again, the pack defence held Scott up, with a massive hit-up from James Fisher-Harris on Thurston saying it all about Penrith’s determination to keep North Queensland tryless in these dying minutes. On the last tackle, Thurston sent through a deft grubber, but Edwards was ready for it, playing it for the richochet off the post in what looked like the end of the night for the Cows, only for a small knock-on from the Penrith fullback to grant North Queensland the scrum feed. As with their previous try, the Cowboys were now so boxed in that it was either try-or-die, and sure enough Feldt crossed over in the corner once again, with Thurston also discovering a more characteristic grace under pressure with one of the most elegant conversions of his career, albeit he barely gave himself time to set up the tee before booting it obliquely through the posts. All of a sudden, the Cows felt as if they might just be back in the game if they could score rapidly, but as the minutes ebbed away it became clear that this was going to be the Panthers’ game, with a field goal from Maloney cementing the win, and his stunning display of leadership over the course of the evening and Moses Leota crossing over in the last minute for six more points once Maloney had booted through the extras. While that makes next week’s game in New Zealand – yet another massive trip – a particularly grueling prospect for the Cowboys, it’s going to be galvanising to see if Penrith can maintain this incredible momentum and defensive aptitude when they take on the Eels for the Battle of the West at ANZ.